My SAGA plan is to build two 4 point war bands to start, so I can test the rules. To make it simple for myself, I just went ahead with two Gripping Beast 4pt starter sets. My post from a couple of days was the Levy from the Skraelings starter set. Simply put SAGA is a points based game, with most games being 6 points aside. To get new gamers off the ground though, it is recommended that they start with 4 point war bands. Gripping Beast sell these nice starting sets with a Warlord, and any combination of a 4 figure Hearthguard, 8 figure Warrior and 12 figure Levy. The Warlords are free. These are all metal figures and are quite nice and usually quite varied (the Skraeling Levy being a bit of an exception as you have seen in my last post). Generally the Levy are armed with bows, spears or slings, i.e. throwing weapons. The Hearthguard and Warriors are, in most cases, armed for hand to hand combat. The Viking starter set is a little unusual in that there is no Levy. There are 2 units of Hearthguard and 2 units of warriors. There was a choice though with the warriors to arm one unit with throwing weapons, so the first unit I have done are armed with throwing spears. These were very nice and the figures were quite varied. There was minimal flash and they were generally easy to paint. I went with the usual process of white undercoat, block painting, AP dark tone, followed by some highlights and then some matt varnish. From what I understand from the SAGA forum, the lower Viking orders wore generally dullish colours, i.e. browns, dark reds and greens. Their undershirts were generally uncoloured linen, so that is with what I went. 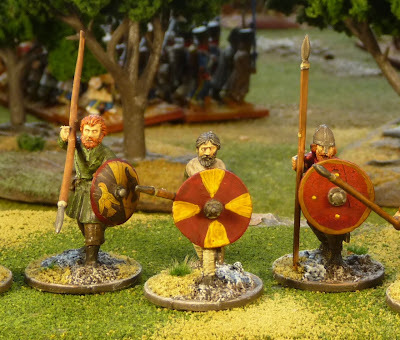 I used some of the Viking LBMS transfers, I was not really enamoured of them, although they were easy enough to apply. Some of the shields were painted, please excuse my first go. As you can see they are nice figures which lend themselves quite well to my painting style. Well there is my first Viking point, it seems I can pump these figures out pretty quickly, so hopefully I will be able to test the rules in a couple of weeks with 4 point aside war bands. I hoping to start to characterize the figures when I paint the Warlords. They look great, John! I think you'll like the rules - we've had some good fun with them. I must admit, I'm sorely tempted by the SAGA rules, as Skirmish fits both my free time and my wallet. Be good to hear more once you start playing in earnest. Nice work John, my Saga figs may get a start soon....fingers crossed??? Those look great John, well chosen colours and shades. Good to see you branching out from Napoleonics. Do you still intend to keep going with the WW2 project? I get the impression that you regret not doing it in 28mm too? SAGA certainly seems flavour of the month and I may eventually have to take the plunge myself. As well as nice figures and terrain, your camera work is producing some really good pictures.